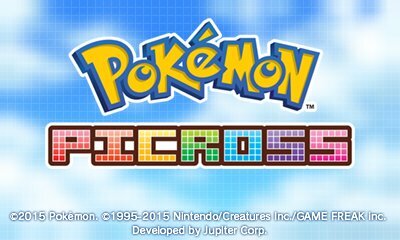 Pokémon Picross is a free-to-play title for the Nintendo 3DS. This game has you complete various Picross puzzles in order to capture and defeat various Pokémon and Mega Evolved Pokémon. The Pokémon you collect will be able to help you to complete the puzzles such as using Lucario's Hyper Scan to fix correct squares or Eevee's which reveals various squares. There are over 300 puzzles within the game with almost 300 Pokémon available. The paid part comes in the form of Picrites which can be spent to access new areas and heal skills so you can use a Pokémon faster than the recharge time. You cannot buy more than 5,000 Picrites, and when you have reached that amount, you'll be able to get more easily in the game as well as, by spending them, remove the time limit. In the game, you are instructed on how to do Picross titles by Professor Tetra and she will help you through all aspects of the game. There are multiple modes including the around 300 normal puzzles, a repeat of those puzzles with the Mega Picross style and huge Murals.